Size 9 hook- gauge isn't really important, so if you're more comfortable with a larger hook size use that. 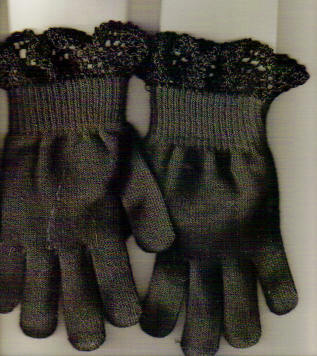 a pair of "magic stretch gloves" - also works on socks. Working into the top of the glove, or sock, or whatever you are adding your edging too..
Rnd 1= Attach thread to glove, chain 4, first chain counts as sc, sc just a bit away. chain 3, sc into glove, ch 3, sc into glove, repeat for a multiple of 5 loops counting the first one. In my example, I used 35 loops. For last loop, ch 3, slipstitch to join in first ch, slipstitch to top of chain 3. Round 2= ch 1, *sc in loop, ch 3, sc in next loop, ch 3, sc in next loop, ch 3, sc in next loop, 5 dc in next loop*, repeat from ** around. On last 5 dc shell, slipstitch to join to the first sc, slipstitch to top of chain 3. Round 6= ch 1, sc in ch 1 space, ch 3, *sc in next ch 1 space, ch 3* repeat around, slipstitch to join, break off thread, weave in ends. size 9 hook or whatever your most comfortable with. 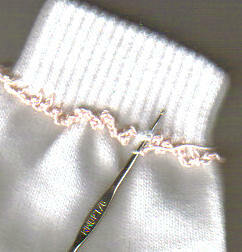 tapestry needle that will fit the size 10 cotton and still go through the button holes. I've got no clue what size I used. Rnd 1-The first row is spaced with the ribbing on the gloves, I placed each sc right under the "down" rib in the top of the glove, ch 3, sc right below the next down rib.Insert the hook into the gloves right below the cuff vertically to work the first row of net. When you get to the last ch 3 , instead of chain 3, ch 1, dc in first ch. Rnd 2-Now you are on top of the last loop you made, ch 1,(does not count as first sc) sc in that loop, ch 3, *sc in next loop, ch 3* repeat around until you reach the last loop, ch 1, dc in first sc. Rnd 4- ch 1,(does not count as first sc) sc, ch 3, *sc in next loop, ch 3* repeat around. This round you do end with a chain 3, slipstitch it to the first sc. Weave in ends. Now make the flowers. Oh so easy! Rnd 1- Ch 6 tightly, slipstitch to form a ring. Rnd 3, ch 1(does not count as first sc), *sc in sc. 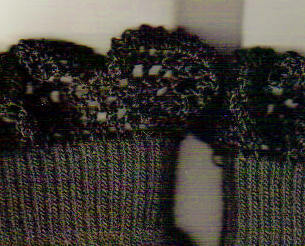 Ch 2, 5 dc in ch 3 loop, ch 2,* repeat on each ch 3 loop, slipstitch to join. Weave in ends. 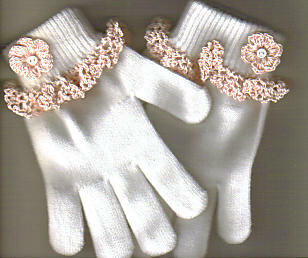 Thread the needle with a bit of the cotton, and attach the flower to the glove with the buttons. Of course, like the first one, it would work with socks too, only you'd put the ruffle on the top of the sock and the flower a bit below it on the inside so when you folded down the cuff it would show.